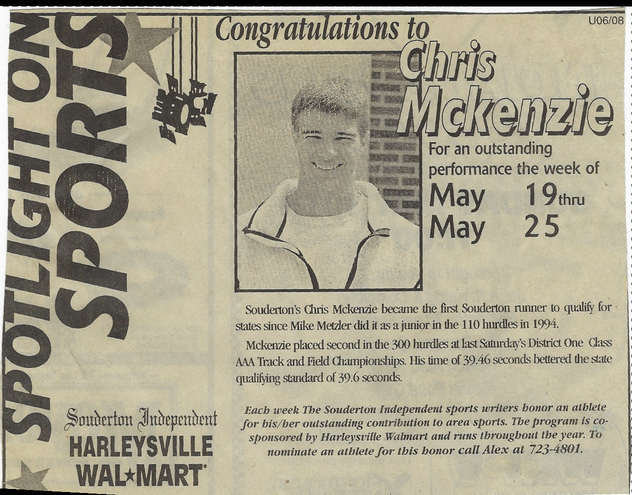 As a Souderton Area High School athlete in my prime, I tore my hamstring my senior year during track and field. I was a sprinter, and I had ran at the state meet for the 300 hurdles the year before, gaining me lots of Division 1 college interest. Despite working with the school athletic trainer who focused on that hamstring, I did not recuperate from this injury with time to return to states my senior year, and all those big name schools just dropped to the wayside. My Div. 1 college dreams (and future Olympic dreams) were seemingly crushed. I knew I still had talent, so like every person with a "will," I found a way. I attended Penn State University for college, and eventually walked on the track team a few years later….. and after a few months of training, I tore the same hamstring…again. “I didn’t understand,“ I thought. “It’s been a few years, how could this still be happening! ?.” Despite working with the college athletic trainer, who again put much focus on my hamstring, I could not return to running fast. It was just too painful. My Division 1 college and Olympic running dreams were now officially crushed. These experiences fueled my desire to attend physical therapy school. While in graduate school I had some excellent training, and mentors in sports physical therapy. And looking back on my hamstring injuries of the past, I learned that the root cause of my problem had never been addressed, and I was bound to tear my hamstring again, and again. I'm not one to mope around, and I was never really the kind of person who did self reflection. I'm the kind of person who accepts that "things happen for a reason," and just ‘giddy up,’ and get on with it. Make the best from what is going on--that defines me. But, when I learned what the root cause of my problem was--that no one else saw--I sunk a little bit, ok… a-lot a bit, in my chair. I relied on other professionals to help me, and they didn't. My dreams--up in smoke--from someone else's lack of knowledge and performance. That's when the emotion of it all hit me. Physically we all can take pain, but emotionally, even now, this is a hard swallow. I became a physical therapist, and started McKenzie Sports Physical Therapy because I don't want anyone's athletic dreams to be crushed from something that is fixable, and likely preventable. Along the way, I had some excellent hands-on training for the shoulder and elbow, and naturally I began seeing more baseball players as baseball has a lot of those injuries--too many injuries. I developed a custom physical examination for baseball players/pitchers that identifies the weak areas of the players body; muscle weakness, poor flexibility, too much flexibility, poor movement patterns, etc. Thru this exam, and the subsequent treatments aimed at resolving the problems that were found, I am able to successfully increase a players ability to painlessly throw harder, hit with more power, and run faster all while significantly reducing future injury risk. I am now doing these exams for all sports. In my opinion, if any athlete does not receive an exam like the one I perform, they are rolling the dice, and may end up with the same outcome as me... ..feeling crushed, and like a waste of athletic talent. McKenzie Sports Physical Therapy was born out of my personal pain, and a true concern for others athletic achievements not to be hindered by the same things that brought me down. How is McKenzie Sports Therapy different? 1. We believe in a total body examinations, because after all, they body is inter-connected. If one body segment is weak or tight, it places stress on another. And sports require total body movement. Thus, ‘single joint’ exams are a thing of the past. 2. We believe in manual therapy, hands-on physical treatments. I’m talking like 20-30min of your session is 1-on-1 with a board certified specialist PT. 3. We spend a lot of time with our patients making sure they understand how the problem happened, and we educate about the ‘disease’ process so there are no gaps in knowledge or awareness about their condition. 4. You are constantly observed to make sure you are performing your exercise program correctly. You won’t get better faster, otherwise. 5. We are on the cutting edge of the latest research (aka-- knowing the root causes of problems and best ways to treat them). 6. We are board certified specialists of orthopedic and sports physical therapy. Ninety-nine percent (yes--99%) of the physical therapy profession are not board certified specialists. Why would you entrust your care to someone who is not specialized in your problem area? These are difference makers in our practice, and why our patients feel better, move better, and perform better every day we see them. They get REAL FAST RESULTS. Call us now to set up your appointment. We won't let you down. 267-332-8102.